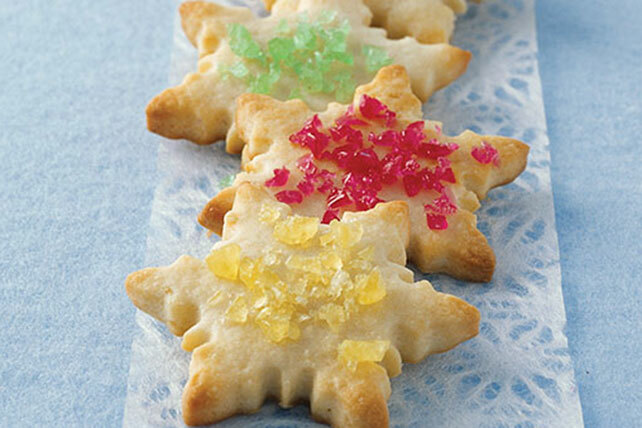 Starting with mostly pantry items, this recipe has variations for four kinds of cookies, including festive mosaic cookies and almond crescents. Beat cream cheese, butter, granulated sugar and vanilla in large bowl with electric mixer until well blended. Add flour and baking soda; mix well. Cover. Prepare and bake cookies following one of the following variations. They all look great on their own or arranged decoratively on a serving tray. This versatile cookie dough can make several types of festive cookies for your holiday gift baskets. Prepare dough as directed, using one of the following flavor options: Mosaic Cookies: Preheat oven to 350°F. Roll dough to 1/8-inch thickness on lightly floured surface. Cut into assorted shapes using 3-inch cookie cutters. Place on foil-covered baking sheets. Sprinkle each cookie with 1 tsp. crushed ring-shaped hard candies. Press gently into dough. Bake as directed. Makes about 3-1/2 doz. or 21 servings, two cookies each. Choco-Orange Cookies: Add 1 Tbsp. grated orange peel to dough. Shape into two 8x1-1/2-inch logs; wrap in plastic wrap. Refrigerate 1 hour. Preheat oven to 350°F. Unwrap logs; cut into 1/4-inch-thick slices. Place, 2 inches apart, on baking sheets. Bake 12 to 15 min. or until edges begin to brown. Cool on wire racks. Drizzle with 4 oz. melted BAKER'S Semi-Sweet Baking Chocolate; let stand until set. Makes 5 doz. or 30 servings, two cookies each. Spiced Cookies: Add 1 tsp. each ground cinnamon, ground ginger and ground nutmeg. Refrigerate 30 min. Meanwhile, combine 1/4 cup granulated sugar and 1/2 tsp. ground cinnamon; set aside. Preheat oven to 350°F. Shape dough into balls. Roll dough in cinnamon-sugar mixture. Place on baking sheets. Flatten to 1/4-inch thickness with bottom of glass dipped in the remaining cinnamon-sugar mixture. Repeat with remaining dough. Bake 10 to 12 min. or until lightly browned. Makes about 3-1/2 doz. or 21 servings, two cookies each. Almond Crescents: Add 1/2 tsp. almond extract and 1 cup finely chopped PLANTERS Slivered Almonds to dough. Refrigerate 30 min. Preheat oven to 350°F. Shape balls of dough into crescent shapes; place, 2 inches apart, on baking sheets. Flatten slightly. Bake 10 to 12 min. or until lightly browned. Cool slightly on wire racks; sprinkle with sifted powdered sugar. Makes 5 doz. or 30 servings, two cookies each.